A picture is worth a thousand words. Similarly, the design of a book is worth a thousand calls…by your salesperson! 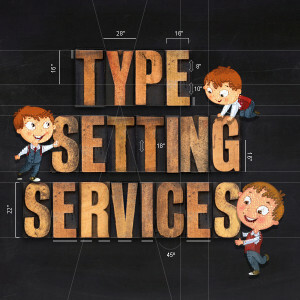 You can achieve this through our top-notch, typesetting services. A Good book is not only about the author, the content, or the language. It is also about the visual appeal the book holds. Our Book Layout Design / Digital, prepress / Typesetting Services, not only ensure the context is understood visually, but also that the right message is transmitted to the reader. We have a large pool of professionals who are ready to typeset any book. Thus, from educational books and journals to fiction books, we have the capabilities to make every book stand out in the crowd. Adobe InDesign: With Adobe Indesign you are at liberty to prepare and process all sorts of documents from simple flyers and complete eBooks, as well as presentations, certificates and newsletters, etc. and more. Additionally, with world’s biggest photo editing software behind it, Adobe Indesign is a one-stop processing workshop, which we invite your work into. However, does your work need graphical content to enhance the readability of your work further? Adobe Indesign has excellent supports to flash content and other multimedia inclusions. LaTex: Over the years, Latex has come to mean an industry standard in high-quality professional typesetting. Specifically, Latex includes features designed for the production of technical and scientific documentation. LaTeX is the de facto standard for the communication and publication of scientific documents. Thus, we offer Latex loaded book layout design services which prepare your work in the best possible publishing way. Page Maker: Probably, the first desktop publishing brand over the years, remains as robust and efficient even today. In producing the finest publications over the years, Adobe systems Postscript Page Maker has established its name as the foremost typesetting service. Naturally, we are proud to say that, our organisation in partnership with Adobe Page maker, has delivered and will continue to deliver typesetting services of the highest quality. MS Word: The basic content tool which almost everyone involved content development knows about. An essential branch of the Microsoft Office suite, MS Word has always been the go-to document editor. Therefore, a text editor like nothing else, MS Word, has over the years grown to include third party supports, add-ons, and included robust features for the best document processing one can ever expect. Adobe Photoshop: Yet, another efficient tool from Adobe, Photoshop is every image processors dream come true. Thus, it has every possible image editing tool, like touch and heals, cropping, background layering, fonts support, free size composure settings, hue and designs, everything that you need your images to come alive. Therefore, we pride ourselves on providing Photoshop expertise to all our projects, making them fill up with life. XML First Typesetting: Typesetting requires a certain level of workmanship, and this is specifically true in the case of XML typesetting. XML encoding and decoding requires a skill beyond another but promises a fully customizable approach to the preparation of documents, workbooks, and digital counterparts of your books. Thus, at our organisation, our XML specialist teams, ensures that you have all the freedom and involvement in making your vision come true over every step. Ask us for a free sample, contact us today.